In this assemblage painting, a blindfolded portrait bust of the artist is flanked by left- and right-facing profiles, conveying the impression of a rotating image. Davis has painted the map of the United States on the background of the right side of the painting and that of Africa on the left. 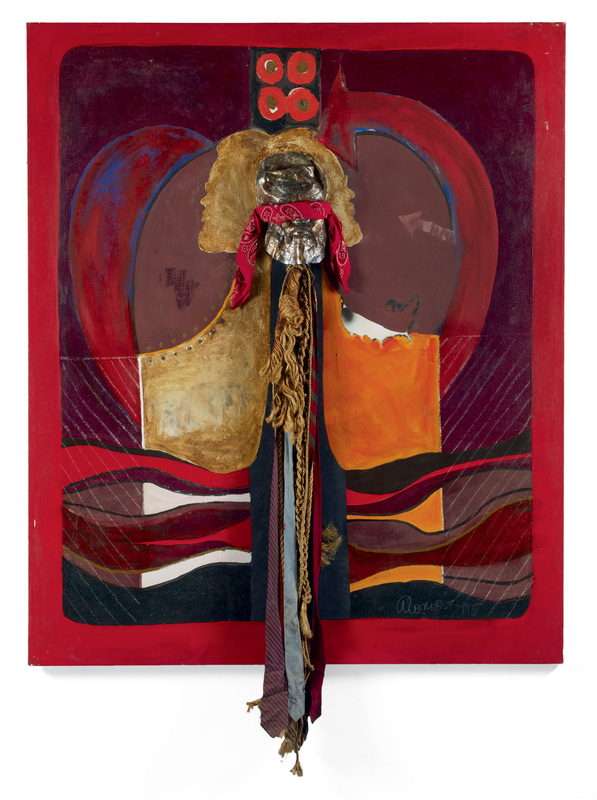 The imagery that he used to construct his likeness, the repeated portrait, the blindfold, and the representations of places reference a mixed African and African American history, and the impact that this has had on the artist. "Self-Portrait Inside Series." Now Dig This! Art in Black Los Angeles, 1960–1980 Digital Archive. Los Angeles: Hammer Museum, 2016. https://hammer.ucla.edu/now-dig-this/art/self-portrait-inside-series.